Philadelphia abortionist Kermit Gosnell’s capital murder trial continues this week in a courtroom packed with worn, bloody furniture and outdated equipment seized from his dilapidated abortion clinic, which has come to be known as the “House of Horrors.” Gosnell is charged with seven counts of first degree murder for killing newborn babies born alive after abortions by snipping their spinal cords with scissors. He also faces one count of third degree murder in the overdose death of a patient, Karnamaya Monger. Meanwhile, the abortion lobby continues to fight clinic regulations that would ensure emergency workers have gurney access to procedure rooms if such rules are an outrageous demand meant to deny women their Constitutional rights. But the truth is that if Gosnell’s clinic had complied with such rules that have since been enacted in Pennsylvania, Karamaya Mongar, the immigrant that he is accused of killing during a second trimester abortion procedure, might still be alive today. “All over the country that have affidavits and other documentation of unqualified workers performing tasks that the laws say should only be done by licensed individuals that included everything from starting IVs to helping with the surgeries,” said Newman. “In 2009, we had four of former employees of late-term abortionist LeRoy Carhart come forward and relate very much the same story as told by Gosnell’s workers of drug violations, unqualified medical practices, dirty conditions, falsified ultrasounds, and other abortion abuses. 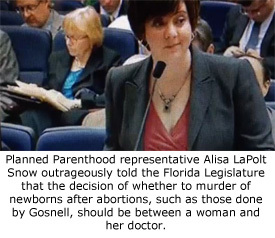 Massof testified of such manipulation of the ultrasound scans in detail during his testimony against Gosnell last week. He demonstrated with hand motions how he would raise the abdominal ultrasound transducer to a higher plane that it should be in order to make the baby in the womb appear smaller, very similar to the manipulation process described by Carhart’s former employees. A Wichita abortion clinic bought and closed by Operation Rescue revealed dirty, roach-infested conditions, a leaky roof, moldy ceilings and walls, and blood-spattered wash room where the contents of the abortion suction machine bottles was dumped down a sink and ground up in an industrial garbage disposal in conditions nearly identical to those identified by the CSU officer and employee Eileen Hampton. 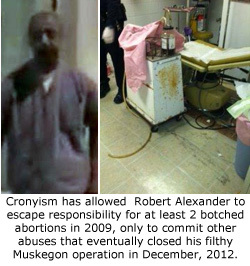 In Muskegon, Michigan, earlier this year, police responding to a call of broken class at an abortion clinic operated by Robert Alexander discovered such filthy conditions, including filthy surgical instruments, that the clinic was closed immediately by the Fire Marshall. This clinic would still be operating today had it not been for the police’s discovery. But perhaps most disturbing is the allegations that earned Gosnell’s abortion clinic the “House of Horrors” moniker and designation as a charnel house. Inside the clinic was found the remains of viable babies that had been murdered after being born alive. Their spinal cords had been cut with scissors in what Massof described as a literal beheading where the brain was separated from the babies’ bodies. 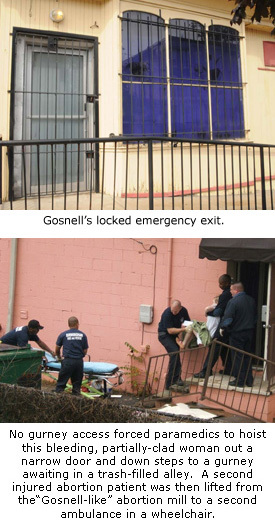 The primary difference between Gosnell’s “House of Horrors” abortion clinic and so many others around the country seems to be that he was caught. Americans can only wonder with dread how many other Gosnell-like clinics continue to operate under the protection of political climates like those described in the Gosnell Grand Jury report that ignores abortion abuses in order to protect abortion businesses at nearly any cost. Last week, CSU Officer Taggart described the condition of Gosnell’s abortion building where metal polls help up a leaky roof and the stench of death and cat urine lingered. Those conditions have only continued to deteriorate as the clinic has stood idle over the past two years. The leaks in the roof have expanded. The ceiling and drywall is moldy and coming down. Exposed electrical wires create a safety hazard. It has become so unhealthful to enter the building that Prosecutor Joanne Pescatore told the judge that she got sick the last two times she was there. Taggart said he expects the building to fall in soon. In Gosnell’s home, authorities discovered $250,000 in case stuffed under his mattress. Safes inside his clinic were found to contain envelopes stuffed with twenty-dollar bills. Gosnell was said to own at least six properties, including a home on the bay with a large boat and private boat dock.